The Royal Palace collection contains an icon by an unknown Greek zograph. According to the Cabinet of the President of the Republic records, which are kept in the Archive of Yugoslavia, two icons with the same depiction were catalogued in the period between 1957 and 1980. The first one was listed as “Icon – Saint George“ and was found in the Royal Palace in 1953 (at that time called “the Old Palace“), while the second one, titled “Saint George on a white horse“ was purchased from a Belgrade collector in 1957. Today, the Royal Collection still contains only the second icon, which is the subject of this paper. According to legend, Saint George, i.e. George of Lydia (around 280–305 AD), whose ancestors were from Cappadocia, was a Roman soldier. He renounced material wealth and high rank in the name of Christian faith. He was executed by the order of emperor Diocletian, for refusing to honour pagan gods. Widespread cult of this saint was particularly influential in Georgia. 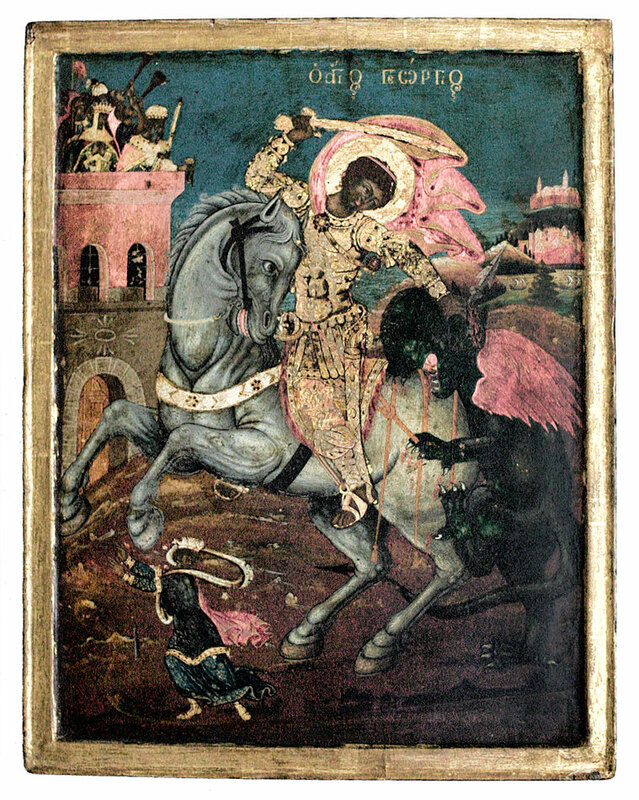 The Iconography of depicting St. George is based on honouring the cult and tradition of one of the most revered warriors of Eastern Christianity. The depiction of this saint is related to the miracles he performed after his death. The icon from the Royal Palace depicts one of the miracles: rescuing the city of Berytus ruler’s daughter. According to legend, near the city of Berytus in Palestine, there was a dragon which brought great distress to the local population by killing men and spreading plague. The inhabitants of Berytus turned for help to their ruler, and he told them they must sacrifice a child every morning, to appease the dragon. They accepted it and started sacrificing children, by the shore of a lake, where the dragon devoured them. When the turn came for the ruler’s daughter, St. George came, riding a white horse, carrying a lance. When the dragon emerged from the lake, St. George charged to it, thrust the lance into its jaws and slew it. Then St. George told the princess to tie her girdle around the dragon’s neck, and so he dragged it into the city. The ruler and all the citizens, seeing the miracle St. George performed, converted to Christianity. 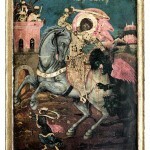 The icon depicts the moment when St. George, on a galloping white horse, rescues the princess by slaying the dragon. In the top left corner, from a balcony of the city tower, the ruler and his entourage watch the dramatic event. In the front, there is the petite fine figure of the princess, running away from the raging beast. Shown in his lavish golden armour, with a halo and a red flapping cape, St. George wields his sword, while holding the beast’s open jaws with his other arm. His figure on the horseback is the biggest and most important in this composition, above which there is an inscription in Greek, indicating his name. The colour pattern is dark, the colours are intense, with red, blue, green and golden prevailing. The style of the icon belongs to the 18th century Greek school and very much resembles the work of the Greek zograph Adamopoulous, from the mid-18th century. In stylistic terms, this zograph made an almost identical devotee’s icon in 1746, for the Patriarchy temple of St. George, as the gift from Ioanichie III Caraga, the Patriarch of Constantinople. Silver framing was added in 1763.